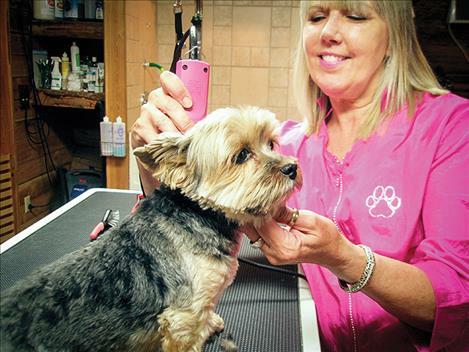 Beverly Weimar opened a dog grooming business in Elmo last June. 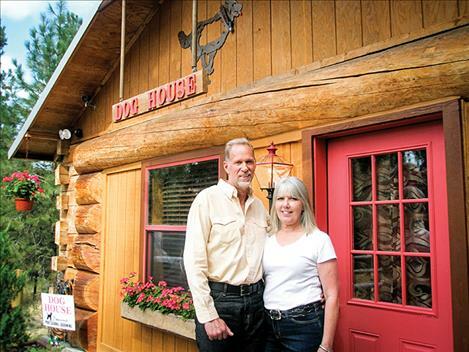 Beverly Weimar and her partner Gerry Albus stand in front of the Dog House whcih opened in June. 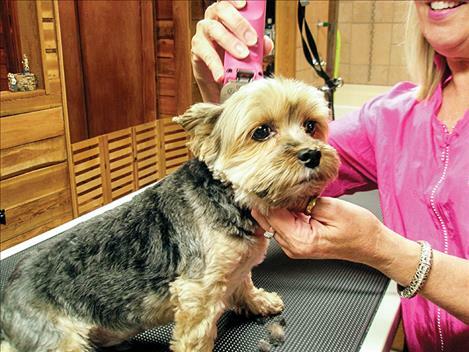 ELMO – After 14 years of working as a dog groomer for someone else, Beverly Weimar was ready to strike out on her own. 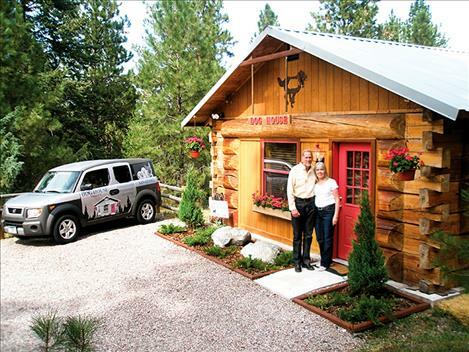 She opened the Dog House at 27534 Ricketts Road full-time in June. 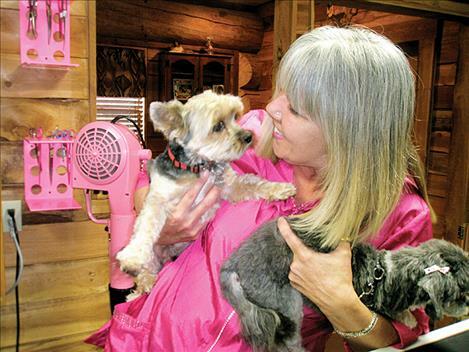 She had been an apprentice and then a dog groomer at the Critter Corral in Kalispell, but decided to open her own business when the Corral moved to Whitefish in late May. “I feel ready for my shop because I paid my dues,” she said. 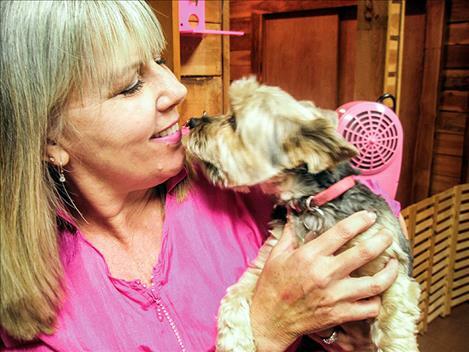 She and her partner, Gerry Albus, took advantage of her 20-acre property with Albus renovating a horse barn into the Dog House. Weimar gives each dog that she cares for individual attention it may not get at larger retail establishments, she said. 2 1/2 hours, she said. A number of her former clients have followed her, Albus said. “She gets referrals from a lot of vets,” he said, adding that Weimar works with a lot of “hard-to-deal-with” dogs that don’t like to be groomed. 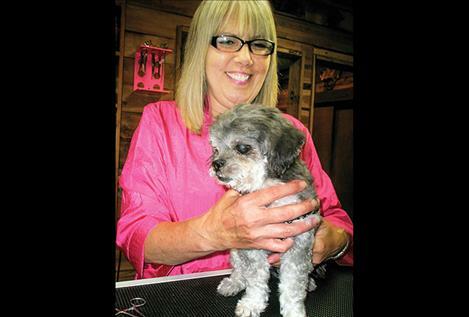 Weimar began dog grooming after moving from Washington 16 years ago. “It occurred to me that my dog (a standard poodle) had to be groomed and my interest was sparked,” she said. 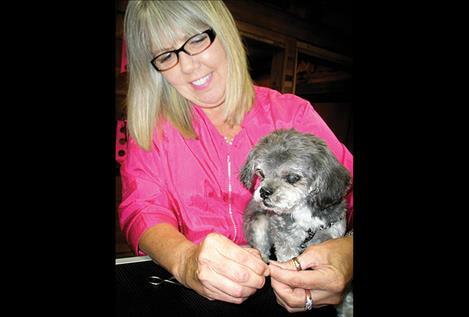 Driving from Elmo to Kalispell five days a week for 14 years speaks to the passion she has for dog grooming, she said. Dog House is generally open from 8 a.m. to 5 p.m. Monday through Friday, but Weimar notes the hours are flexible. Appointments are required by calling 406-849-6364 (849-6DOG).